One of the most commonly used measuring devices in science is the graduated cylinder, which measures liquid volume. Since graduated cylinders come in different sizes, they also measure with different degrees of accuracy. Graduated cylinders can be made of glass, borosilicate or plastic and must be read carefully to ensure accuracy no matter what material is used. The term "graduated" comes from the gradations, or measurement marks, on the cylinder. The graduated cylinder will have a series of lines to show measurement intervals. Some lines will be marked with numbers while intermediate marks will not be numbered. Smaller graduated cylinders usually have narrower measurement intervals so they measure with greater accuracy. 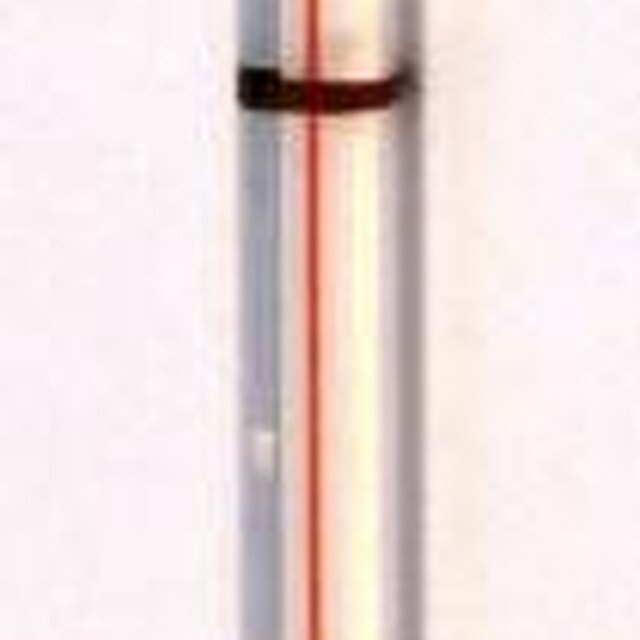 As a scientific instrument, the graduated cylinder uses the metric system rather than the U.S. standard system, so measurements are in milliliters instead of ounces. Milliliters, abbreviated as mL or ml, convert to cubic centimeters, written as cc or cm3. Therefore, 20 milliliters (20 ml) of a measured liquid has a volume of 20 cubic centimeters (20 cc or 20 cm3). Count the number of smaller divisions between marked intervals. For example, suppose the marked intervals are 1 ml, 2 ml and so on, and there are five smaller divisions counted from one numbered line to the next. In this case, the measurement interval marked by each line equals 1 (the numbered interval) divided by 5 (the count from one interval line to next), or 1 ÷ 5 = 0.2 ml. So, this sample graduated cylinder measures accurately to 0.2 ml. Reasonable estimation can be made if the measured liquid lies between the marked intervals, but this estimated reading will be less accurate. All liquids have cohesion or attraction between their molecules. This cohesion holds the surface of the liquid in place, but molecules in contact with the side of a container adhere to that wall, resulting in a curved surface. This curved surface is called the meniscus. The curve of the meniscus depends on the liquid. Water and mercury have two of the most extreme curves because of their strong cohesion. Isopropyl alcohol, on the other hand, has a very flat meniscus. To correctly read a graduated cylinder, the surface at the center of the meniscus must be read, not the top of the ring of liquid clinging to the wall of the graduated cylinder. For most liquids, this "center" will be the lowest point of the meniscus. For a very few liquids, like mercury, the center of the meniscus will be the highest point of the liquid. To properly read the meniscus, your line of sight must be level with the center of the curve of the meniscus. Once the measurement interval has been determined and the meniscus evaluated, reading a graduated cylinder is a matter of attention to details. Looking straight at and level with the center of the meniscus, read the numbered line below the meniscus. Add the incremental measurements up to the last mark below the meniscus. If the center of the meniscus is not aligned with a premarked gradation, estimate the amount of additional liquid above the line. For example, suppose the amount of liquid measured in the graduated cylinder lies about one-third of the way between the third and fourth intervals between the 60 ml and 70 ml marks. There are, counting up from the 60 ml mark, 10 intermediate marks. Dividing the interval (70 – 60 = 10) by the number of increments (10) shows that each intermediate mark equals 1 ml because 10 ÷ 10 = 1.0 ml. 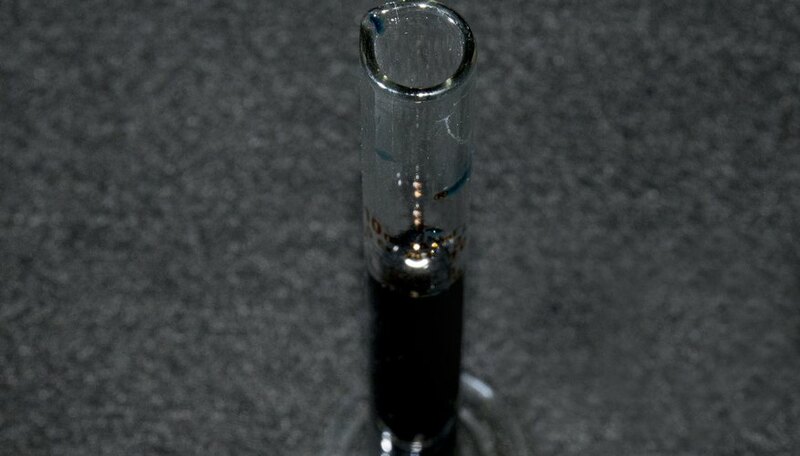 Adding the measurements therefore gives 60 ml plus 3 ml plus the approximately one-third ml, or 60 + 3 + 0.3 = 63.3 ml of liquid in the graduated cylinder. Because of their shape, graduated cylinders fall over easily. When possible, steady the cylinder with one hand while pouring liquids in. Glass graduated cylinders may chip or break if they fall over. Many come with a plastic protective ring to prevent the top of the cylinder from hitting if the cylinder falls over. As with any glass container, take care to prevent breakage and report spills, broken glass or accidents immediately. G, Karen. "How to Read a Graduated Cylinder." Sciencing, https://sciencing.com/read-graduated-cylinder-4780284.html. 15 October 2018.